Experience how realistic racing can be with this Thrustmaster set! This is the Thrustmaster "All Star" pack for PlayStation and PC gamers! 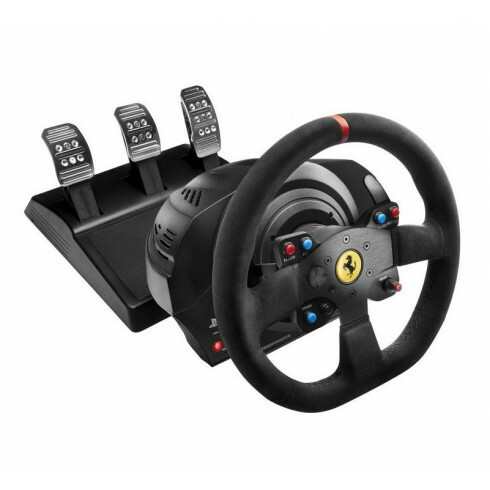 Combining a T300 force feedback servo base, Ferrari 5999XX EVO detachable wheel (11.8”/30 cm) with Alcantara coating and a T3PA pedal set makes this an awesome racing wheel and pedal set for very realistic racing and a lot of fun! The realistic force feedback shakes the wheel as if your racing over real race tracks and when you add a Playseat® racing chair it will feel like you're seated in a real car! The Alcantara coated wheel is a replica of the real 599XX EVO wheel and features the officially licensed Ferrari logo for the real Ferrari fans! Thanks to the T300 servo base, you can use this set for PS3, PS4 and PC. For the best, most realistic, most fun experience you need a Playseat® racing chair and Thrustmaster T300 Ferrari Integral Racing Wheel Alcantara Edition! Fantastic wheel, belt driven is only way to go now. Alcantara wheel feels amazing and grippy in the hand. Alcantara can wear out so be sure to take good of care of it and look up ways to maintain. Despite that the feel of Alcantara is incredible and shaves seconds of your laps. Even the pedals are solid, while not the T3PA-Pro they are still very good, especially with the included conical brake modification. Highly recommended. Just like the Play seat this product has changed how I see life, It is exciting and works amazing. I am a kid again at heart using tech that has taken the entire existence of man to create. Try it and change your life like I did!.